Ginkgo Florist is a little shop with a big personality that has brought a new sense of style to Dublin. Ginkgo is a place where flower-lovers can pop in to chat about their garden and see what’s new. We’re named after Ginkgo biloba, an Asian tree with only one living species that has been around since the dinosaurs – that kind of longevity would be nice but we’re taking it one year at a time! 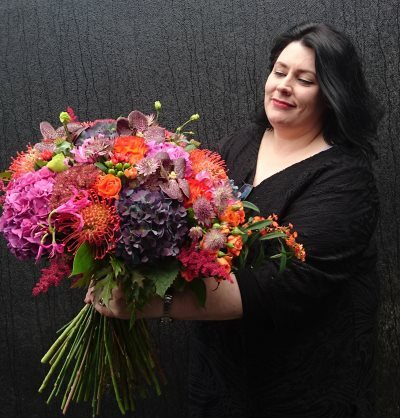 Owner Bronagh Harte has a Degree in Horticulture, over a decade’s experience in floristry and loves cactus. To see what we’re up to, check us out on instagram and facebook. I chatted with the woman behind the front counter for a little while, and she gave me some great advice on how to take care of my new Orchid plant I’m attempting to foster back to light…. Happy to see such a gorgeous store opening where I can see all the beautiful flowers as I walk by each day, although, this could prove dangerous to my wallet in a few weeks time… Nikki P.
Darn it, I may know next to nothing about flowers (hence my visit here) but I know a fantastic customer experience when I see one.